Dual Cheltenham Gold Cup winner Kauto Star has shown off his new dressage skills at Newbury racecourse. The five-time King George VI Chase winner went around the parade ring for eventing rider Laura Collett. Collett told BBC Sport: "It was encouraging. He was excited by the crowd but managed to contain himself." Kauto Star was retired from racing in October by owner Clive Smith, who later fell out with champion trainer Paul Nicholls over future plans. "He was a little on edge and it probably didn't help when the crowd cheered as he came in, but he did well and there seemed to be a lot of positive vibes," said Wiltshire-based Collett. Nicholls hoped the record-breaking racehorse might stay at the Somerset stable that had been his base for several years during a memorable racing career. Smith wanted to keep the gelding active with a new challenge. Kauto Star's former stablemate Neptune Collonges, who won the 2012 Grand National, was also switched to dressage by owner John Hales. 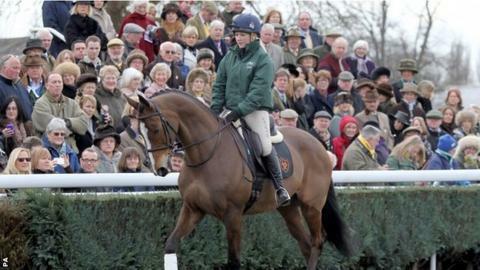 The BBC reported on Thursday that Kauto Star will not compete in the discipline at the 2016 Olympic Games. British eventing chief Yogi Breisner said the horse is too old, having raced until the age of 12 before switching discipline, to be a realistic contender in Rio but could make his competitive debut at a lower level in the spring of 2014. "He performed much better than I thought he would," said Breisner after his Newbury outing. "He's only been doing this for about eight weeks and he showed what an impressive horse he is." Kauto Star was greeted by warm applause from the crowd gathered around the parade ring before an exhibition where he walked and trotted for about 10 minutes. "He can do a lot more than he showed today but we were rather restricted with the area," said Breisner. "The biggest test for an ex-racehorse is whether they can do the canter well. It's much more collected in dressage but he's taken well to it. "The plan is to do a dressage trial some time in the spring. We're not planning to go to Rio but hopefully he can enjoy himself and keep improving."